We spend a fair amount of time on Pinterest, vying after the inspired interiors, DIYs, recipes (and everything else! ), the site has to offer. With the abundant array of eclectic styles and spaces out there, we find ourselves constantly aching for a renewal in our homes. That’s not just us, right? Since we’ve all collectively accumulated our fair share of Pin-worthy interiors, it’s only right that we share them with the world. With the bedroom in our mind, we took to the site to peruse the interiors that make us want to redecorate. From the bold and the extravagant to the beautifully understated, read on to see the best Pinterest bedrooms and what we learned from them. If you ever found yourself in need of a tonal switch-up, allow this stunning scene designed by Sarah Sherman Samuels to be your guiding light. An inspired medley of warm hues make for an effortless cool complement to the rattan furnishings of this boho chic bedroom. Here’s to embracing the simplicity of Scandinavian design and taking a non-traditional approach to staple furnishings. Utilizing a chair in lieu of a bulky nightstand is one way to do it. Make a statement in a minimalist bedroom with a headboard or bed frame that comes with a wow-worthy effect. We’re swooning over this ornate rattan option. A stunning bedroom and ultra-clever DIY all in one. Could we ask for anything more? See how interior designer Sarah Sherman Samuel crafted a seriously chic headboard to elevate the whitewashed simplicity of this A-frame cabin. If there is one thing we learned from Hilton Carter’s converted loft, it’s that there’s no such thing as too many plants—seriously, he has over 140 in his home. Suffice it to say, his bedroom is no exception, featuring a stunning array of greens beautifully dispersed about. Our favorite part? The canopy that graces the spot above the bed. 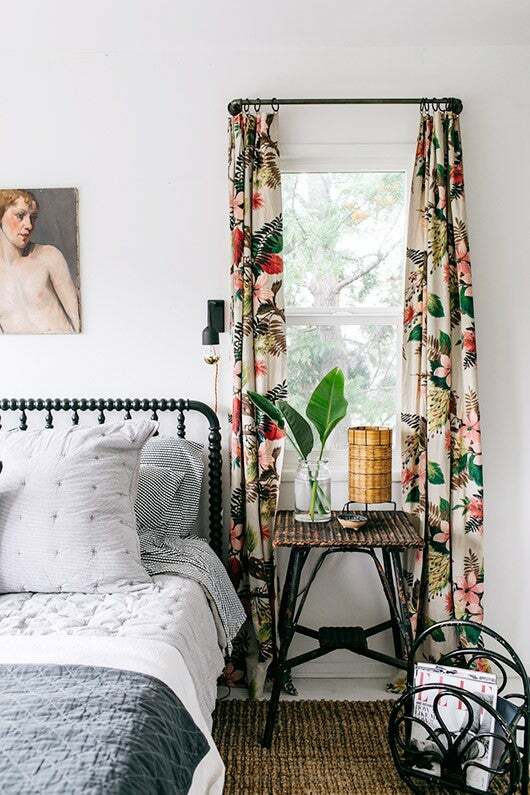 Alison Roman’s eclectic style definitely skews towards the mod and minimalist, and her light-filled bedroom perfectly captures the essence of the combined aesthetics. A trio of greens and a wall hanging above the bed provide the otherwise whitewashed room with just the right touch of color and texture. Photography by UVA DO MONTE VIA THE INDEPENDENTE COLLECTIVE. Leave it to this dreamy lodge in Portugal to inspire some serious room envy and make a case for painting our bedroom walls in a saturated pink. The room’s old-world flair is reminiscent of a Van Gogh, while the unlikely color block between the coral and white alludes to a design detail that’s both modern and fresh. Photography by JONATHAN HöKKLO FOR REMODELISTA. Old meets new in this serene Colonial where a country-inspired aesthetic is elevated by contemporary decor elements. The whitewashed space is hardly snoozy with the understated array of bold hues and the revamped fireplace that’s managed to hang on to its rustic charm. One surefire way to impose an element of style and character to a space? Vibrantly patterned curtains and rattan accents might just be it. We’re swooning over this guest bedroom makeover, which entails a modern-meets-vintage vibe and a monochrome take on layered bedding. Get the full tour on sfgirlbybay. Scandinavian minimalism takes the lead in Emma Persson Lagerberg’s whitewashed bedroom, which exudes an air of effortless perfection. Decorative details that come in the form of wall art and sleek lighting fixtures elevate the monochrome scheme. We’re swooning over the laid back, farmhouse chic finish of this light-filled bedroom, it’s about as quaint as it gets. A bold, forest green wardrobe steals the spotlight in this refined bedroom that comes complete with sleek wooden details and a monochromatic take on linens. We’re all for going back to the basics, inspired by the “less is more” motif of this light-filled space. Warm wood furnishings, linen bedding, and traditionally-luxe architectural details seal the deal. Consider this Scandinavian master bedroom an ideal case study for perfecting modern elegance. We’re swooning over the coupling of the casual bedding situation and the ornate mirror set directly aside. We’re enamored by the bright pop of orange in this colorful spot. Cozy textures and streamlined furnishings set the scene, coupled by printed accent pieces and trendy blush tones. A bedside arrangement of fresh eucalyptus pretty much guarantees the sweetest of dreams. Aside from the lively color detail it contributes to the space, the greens also provide a fragrant essence, which becomes an integral part of the decor. Coupled with the rustic wood furnishings, the look is effortless perfection. The well-thought-out decorative accents of this bright and airy bedroom extend a unique detail to the exclusively whitewashed scheme. Nestled between the adjoining French doors, a rustic nook comes outfitted with a wooden rocking chair and a complementary side stool. A color block of understated pastels pack in major style within this modest bedroom. Our favorite part? The ultra cool and intricately detailed landing pad. The brass bed frame comes in a close second! Think of it as minimalism at its finest. Stripped of the extraneous, this beach-inspired bedroom may come equipped with only a handful of furnishings, but there’s no denying the decorative depth of the unique materials. When your bedroom wall comes with a built-in headboard, take to a colorful revamp to elevate the look. Here, a timeless shade of blue-gray sets the perfect tonal backdrop for the subdued decor scheme that follows. Blues rule in this charming Sydney bedroom, where a reserved color palette helps bind the eclectic finish featuring a modern-meets-rustic foundation. As far as accent walls go, we’re strongly in favor of a daring shade coupled with a whitewashed, minimalist scheme. The unique contrast spans from the decorative finish to the palette of the room, resulting in a mod and unexpected finish. Linen bedding of a gray color palette is always a plus, especially when paired with a streamlined aesthetic. We wouldn’t mind waking up in this sun-filled spot. Follow us here for more ideas and the Pinterest bedrooms that continue to inspire. This story was originally published on March 2017, it has been updated with new information.